Outlook is as one best desktop application using all corporate professional and business user so we need to add identity at the end of each and every mail that can be a very positive impact of mail send Form for the site. So I need to add a signature by default in all mail automatically so here is the guide on how to add signature in Microsoft Outlook setup via Email iCloud Microsoft and Yahoo mail and other custom mail. 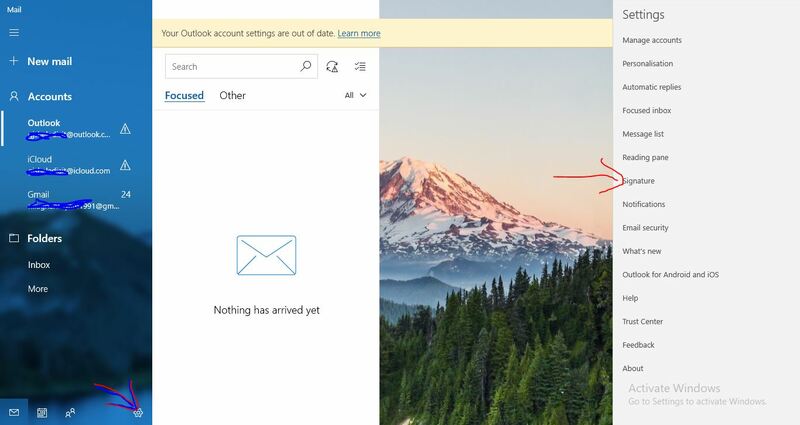 Go to the settings icon near of the Mail. Find the signature of shown in the list of useful settings for the mail app. Here you can add a custom signature for the specific mail account or for all the accounts to apply automatically single signature in your all helicon enable option for apply to Walaikum here you can add gym address name contact number and image files like logo company logo corporate address business address and phone. You can also paste HTML format of your email signature in Outlook mail. All the settings will automatically save and apply to all the mail account automatically. Once you’re done check your settings by sending testing email because it will go to all mails by default if you want to change or edit your saved signature in your mail setup go to previous steps and update you’re existing for saved signature manually.